At this year’s JEC World, the largest trade fair for composites held from March 12-14, 2019, in Paris, SGL Carbon will focus on smart solutions for the automotive industry. In hall 6 at stand D25, the company will present a wide range of tailored components and high-performance materials along the entire value chain under the motto "The Weight and Performance Optimizers." The automotive examples also represent possible innovative applications in other industries. “As a reliable and innovative partner to our customers, we offer tailored solutions across industries, from fibers to finished parts, all from a single source. We help not only to produce lighter components, but also boost performance thanks to greater durability of individual components or improved overall architectures,” explains Andreas Wüllner, President of the Divisional Board of Composites – Fibers & Materials at SGL Carbon. Highlights include a carbon fiber-reinforced rear wall for a high-performance car from a major German automobile manufacturer, which was implemented in serial production in cooperation with SGL Carbon. As a light body-reinforcing element, the design not only helps to keep the overall weight low – it is also crucial for configuring the entire vehicle’s performance. The rear wall structure was laid out to meet load path requirements in cross-departmental collaboration between specialists from material engineering, product design and process design. Joining of metal materials to composite materials also came into play over the course of the project, with SGL Carbon offering just the right material and process expertise. The innovative natural fiber concept for a sportscar manufacturer also celebrated its trade fair premiere. In developing the motorsport model, the focus was placed on both, extreme performance and sustainability. This is why the carmaker opted for a hybrid biology-based composite for the doors and rear spoilers. In concrete terms, the components consist of a combination of biology-based natural fibers and fossil-based carbon fibers as well as conventional plastics. SGL Carbon developed a specifically pre-impregnated natural fiber fabric based on a fast-curing resin. Concepts for accelerated pressing processes and tools engineering were also developed in collaboration with the Lightweight and Application Center of SGL Carbon. 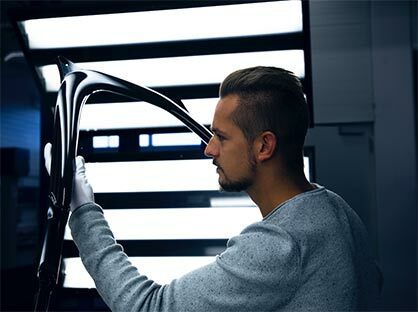 Besides complex structure and fitting requirements, component production also demands extensive surface properties for visible carbon components to ensure a perfect look. SGL Carbon also has many years of experience and expertise in this still important area, demonstrated at JEC World, on the one hand with a strut bar based on braided carbon fibers, ensuring both stability and a visual highlight in the engine compartment of the BMW models M2, M3 and M4 and on the other hand, SGL Carbon will also showcase a mount carrier made of carbon-fiber non-woven materials for a sportscar manufacturer, used in the rear end of the sports car as a platform for installing the spoiler. The glass-fiber reinforced plastic (GFRP) leaf spring is just one component that offers major potential for high-volume serial production. Today, it is already used as a cross leaf spring in the rear axles of around 40 Volvo models, produced at the SGL plant in Austria in a completely automated manufacturing process at a volume of several hundreds of thousands per year – unparalleled in the industry. The major advantages of the springs include a weight reduction up to 65 percent compared to standard steel springs, greater driving comfort and more interior space. The leaf spring can also be realized in a longitudinal form and is currently being implemented in new joint projects with renowned automotive manufacturers from Europe and North America. Growing electromobility also means battery boxes made of glass-fiber and carbon-fiber composite materials are also gaining in importance. SGL Carbon’s high-voltage battery housing concept represents a reduction in weight of up to 50 percent compared with the corresponding steel component. 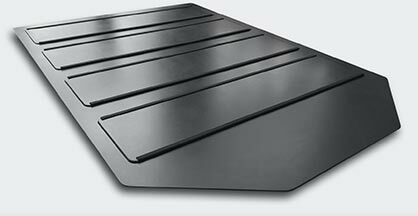 It meets the highest of standards in terms of fire resistance, rigidity, acoustics and both thermal and electromagnetic shielding. With fiber composites, sensors can also be integrated to detect damage in the underbody of the electric vehicle. Damage is recognized early on, so the vehicle electronics can take safety precautions right away. Using carbon-fiber non-woven materials and fiber-reinforced thermosetting polymers helps to map complex geometries with a process streamlined for serial production – yet another testament to SGL Carbon’s aspiration to continually optimize component efficiency and manufacture. At the JEC World, SGL Carbon will also present trend-setting processing and application variants as well as advanced material classes. One good example is the combination of formable thermoplastic profiles and subsequent extrusion coating with thermoplastic short-fiber granules into a complex skeletal structure. This concept was developed several years ago for a BMW cowl component as part of the “MAI Skelett” project sponsored by the German government. The advantages of this approach include integration into existing, highly automated production processes combined with extremely fast cycle times of under 75 seconds per part. 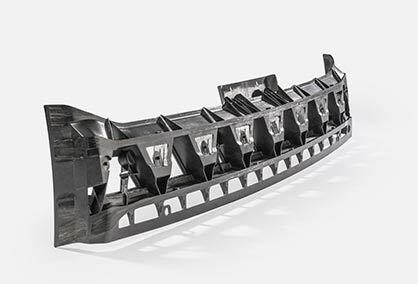 SGL Carbon now offers high-quality thermoplastic profiles pultruded in-house with high fiber volumes (>45%) that can be processed immediately, without blending, thanks to their fully consolidated state. In the “Composites in Action” exhibition space (hall 6, stand S84), SGL Carbon will also be available at the Technical University of Munich (TUM) stand on the topic of fiber placement. This stand will highlight the Fiber Placement Center, operated in collaboration between Fraunhofer JGCV, SGL Carbon, TUM and other partners. Presented at last year’s JEC and headquartered at the SGL Meitingen location near Augsburg, the center aims to launch the production process in major-series applications across industries while optimizing concepts in terms of resources and efficiency.